1. Create a writing plan, and execute the plan to meet my word goals for the 3XN novels. I have been focusing on this task, first and foremost. Hellmaw: Your World is Doomed launched on October 31, 2015 from Onder Librum and I can now talk freely about this project. I’m writing a trilogy in Hellmaw, called The Dagger of Sacrados Trilogy. The first book, Soul Larcenist will be released this month, in late January 2016. I’m just over 50K into the first draft of the second book, Soul Poison and aim to have the book out to Beta readers by February 1st. The third book, Almost Soulless will be finished by August 1st. In between I’ll write a standalone YA novel for another Onder Librum book in the Pony Island universe and complete the main draft by April 1st. 2. Edit and submit to market ALL of the new short stories from 2014. “Black is the Source of Her Smithing” – has 4 more rejections, bringing the total to 6 and is out at a market right now. “Beneath a Cloak of Fear” – has 2 rejections. Since it’s not genre, I haven’t been as aggressively marketing this one. “Papa and the Steam Rifle” – I sent this story to its intended market. They asked for edits but I didn’t have the time for them. So my Stop-Watch Gang colleague, Stephen Kotowych made the edits and it’s now being marketed as a collaboration. So far, mostly thanks to Steve’s enthusiasm, it has 10 rejections and is out at a market right now. “Mr. Ice” – I changed the name of this one, sent it to its intended market, and it was rejected. I’m not much of a superhero author, so this one likely will never be submitted again. 3. 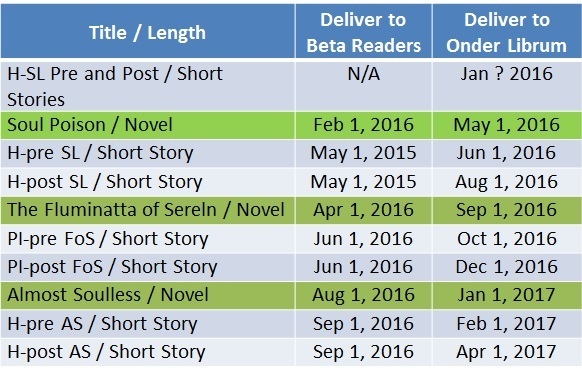 Write, edit, and submit to market at least 1 ADDITIONAL short story, adding to the requirement as I’m invited to anthologies. Done! I wrote “Slaughter-Greedy” for an invitation anthology. I wrote about half of “Proof of Love” for another invitation anthology, and hope I can squeeze the time to complete it in early 2016. 4. Pursue grants in the spring and fall. Epic fail. I did not submit any grant proposals in 2015. 5. Aim for the sub-a-week challenge with my existing inventory, but allow for a low goal of 30 submissions when the 3XN work takes priority. Done! I made 56 submissions in 2015, including delivering Soul Larcenist as well as submitting the galley proofs. 6. Use National Novel Writing Month to sprint for the final 3XN goals of the year. Done! This year, I spent most of November behind the goal line, but hit 50,000 words with one day to spare. I now have about 35,000 words to go on Soul Poison. I posted a very math-intensive summary of NaNoWriMo activities year-by-year. 7. Write a minimum of 300 NEW words every day. Epic fail. I fell off this bandwagon after my knee surgery in April and never climbed back on. 8. Do my best to get ELEMENTS on ballots during award season. Imaginarium 4 from ChiZine Publications. This year I sold one new short story, The Patent Bagger to AE: The Canadian Science Fiction Review, Issue #20, Fall 2015. I sold 3 reprints – the two sales of Jelly to the best-of anthos above, plus “Free Range” to the brand new magazine The Singularity. What else happened in 2015? I had knee surgery at the end of April. The surgeon repaired two meniscal tears, one below the kneecap and one above. He also “cleaned up” the underside of the kneecap. I didn’t get back to “normal” — I still use my cane to walk, but the pain is better than before the surgery and I’ve made a conscious decision to not return to physiotherapy. I posted more details about the knee on my Phoenix post. 2. Finish “Proof of Love” and submit, if time permits. 3. Pursue grants in the spring or fall. 4. Aim for the sub-a-week challenge with my existing inventory, but allow for a low goal of 30 submissions considering the tight deadlines of THE PLAN. 5. Treat every month like it’s NaNoWriMo, especially JAN, FEB, MAR, MAY, and JUN. THE PLAN – AKA 2016 Writing Resolutions | Author Suzanne Church on Another NaNoWriMo WIN!